It's because I mentioned yesterday that we could get snow. The bluebells don't mind, I'm sure. What a pretty, colorful picture!!! Cute picture! Happy spring to you! nice contrast between the snow and the bluebells...so when does the snow eventually clear jenny?? It's snowed in June here before! Usually by late May it's consistently warm, though. 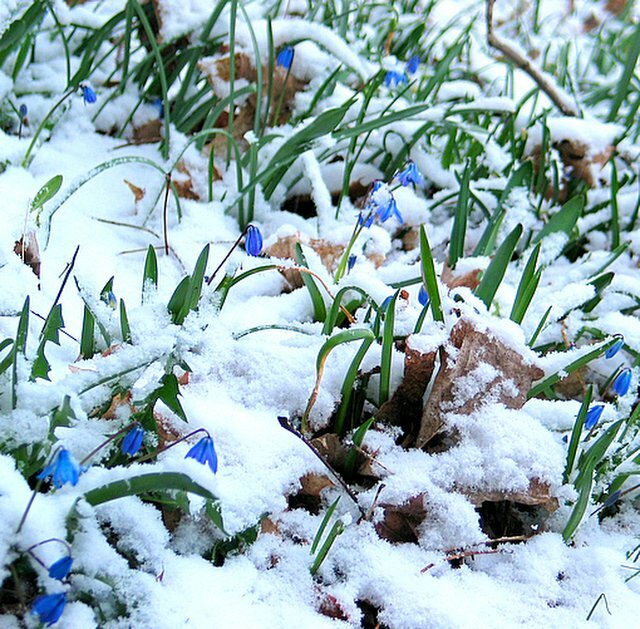 Spring with snow and blue flowers! That's something i'm not accustomed. Great; that blue with the white. Hey! Great shot! I love the flowers peeking out shyly. Wow! Love the 'dashes' of blue on over the photograph. BEAUTIFUL! I love the white against the green! LOVELY!